One of the largest flightless birds in the world. 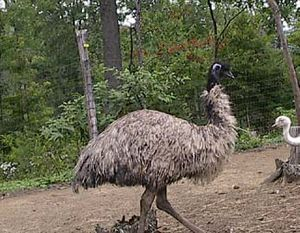 Second only to the ostrich which resides in Africa, the emu can run up to 35 mph, and weigh up to 140 pounds. Its life span is between 30 and 40 years, and it starts its reproduction cycle at about two to three years of age. They are the more docile of the large birds, however, can really pack a wallop when they kick!. They have 3 toes, and the middle toe has a large nail that can slice right through overalls! We saw this happen first hand when we picked up our first pair of emu from an Amish farmer in Ohio. He wrestled in a small barn with the large bird, (where we heard thumps and bangs) and emerged carrying the bird, but his overalls were sliced from his chest to his knee! 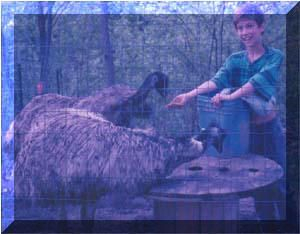 Emus breed and lay eggs mainly during the winter months, while ostriches and rheas breed and lay eggs in late spring, summer, and early fall. Sometimes starting as early as October and ending as late as June, the females lay an egg about once every three days, and will lay, on average, 25 eggs per year. 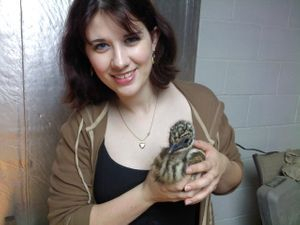 The emu has dark-green eggs that cannot be candled (examined in front of light to check fertility and chick growth) during incubation. Incubation is approximately 50 days. We have found emu to be gentle birds. We walk among them and pet them on their necks and back. They let us examine their wings and, in general, don't mind us in their pen with them. Even gathering the eggs isn't any big deal to them (I wouldn't do the same with the ostrich!!). 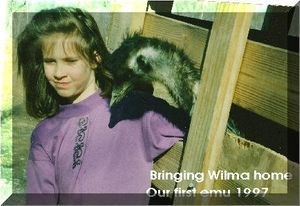 our first emu home in 1997 when Brandon was studying dinosaurs. He so wanted to live with the dinosaurs! We discovered emus and decided that they looked a bit like some of the dinosaurs he was reading about - the velociraptor and such. When we brought our Fred and Wilma home in 1995, it was such a thrill to look out the window and see the elegant birds walking so cautiously and deliberately around the enclosure. They are fence walkers, and will walk the fence line - no matter how long the line is. We have BLOWN EMU EGGS available for crafters for $18 each. 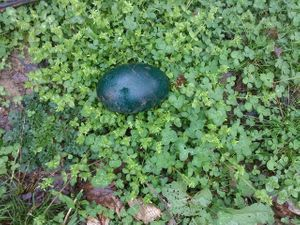 Beautiful Green Emu Eggs. Laid by birds that I own. They have one hole in one end, some have a hole in each end.